Wow, what a great day! I’ve been really looking forward to these Craft & Vintage Fairs at the Working Men’s Club in Higham Ferrers and today went so well which was a great relief!! We had 20 fantastic handmade and vintage stalls including small leather items, cakes, wooden items, vintage haberdashery and kitchenalia, crochet, baby quilts, an author with her children’s books, fabric gifts and home accessories, shabby chic furniture, hair accessories and much more! As always, lots of customers commented on how impressed they were with the high quality of the stalls and the wide range of items on offer. I saw lots of people leaving with bags full of goodies which is always a great sign! It was nice to have a chat with customers as they enjoyed a cuppa and cake and they told me their thoughts about the event. All were very keen to take a flyer with the upcoming dates so I’m sure they’ll become regular visitors. Feedback from stallholders was equally positive and I really do appreciate the compliments and the constructive ideas – one person suggested an arrow by the Queen’s Head pub to point people in the right direction which is a great idea so I’ll do that next time. It was the first event where I didn’t do a table plan and so everyone chose where they wanted to set up which seemed to go well, thank you also to all those who helped put the tables and chairs back at the end! 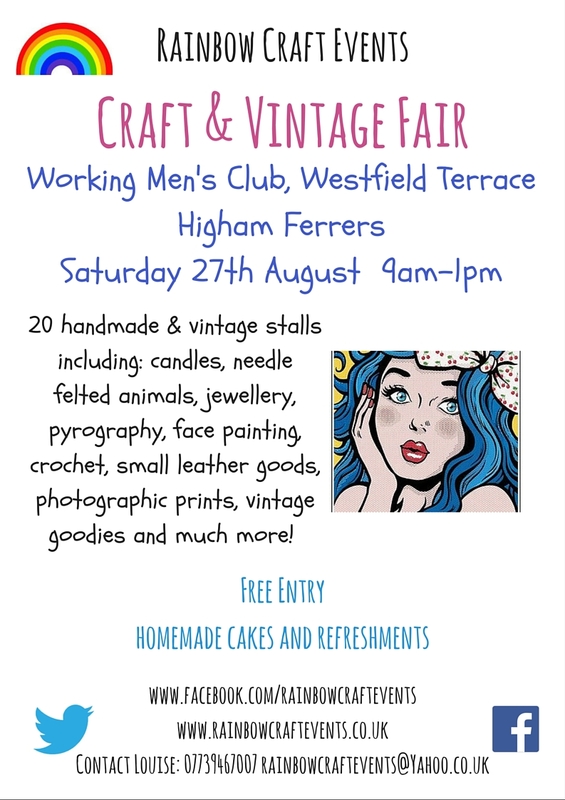 So first of all, the good news: tomorrow is the first Craft & Vintage Fair at the Working Men’s Club in Higham Ferrers during the monthly Farmers Market and it’s set to be FANTASTIC! 20 fab stalls including vintage kitchenalia, jewellery, small leather goods, face painting, sweet cones, needle felted animals, turned wooden items, candles and wax melts, baby quilts and bunting, vintage inspired crochet, hair accessories, wood carvings, shabby chic furniture and much more! Come and browse all the lovely goodies on offer and enjoy a lovely cuppa and homemade cake. All stalls are handmade or vintage and of a really high standard. Sure to be something to suit all tastes and budgets! These will run monthly on the last Saturday of the month to coincide with the ever popular Farmers’ Market so there’s lots going on in Higham Ferrers – come and visit! Tomorrow there are free raffle tickets being given out during the market so be sure to pop over and get one! And the not so good news: due to unforeseen circumstances I have unfortunately had to cancel the Nearly New Sale/Craft Fair in Raunds on Saturday 6th August. All stallholders involved have been emailed. The next one, however, on 15th October 1-4pm is still good to go and I am starting to take bookings for this event so please do get in touch if you’re interested (rainbowcraftevents@yahoo.co.uk). This event will be set across 2 rooms, the first for over 25 handmade stalls – not necessarily child related! – and the second room will be for people selling preloved baby and children’s clothes, accessories, toys and books. The tables on the Nearly New Sale will be on offer for only £8 and all stallholders receive a free hot drink, bottle of water and a cereal bar to keep them going! As always, entry is free and there will be refreshments and homemade cakes too. I’ll look forward to hearing from you! PS The poster is a sneak preview of next month’s Craft & Vintage Fair!! Some people have been asking about this event which will be held on Saturday 6th August at Saxon Hall in Raunds…so I thought I’d write this blog to explain it a bit more! At Saxon Hall we are lucky enough to be able to use 2 rooms for events. This means I can separate the types of stall to make it clear for customers what each room is for. So at the Handmade, Vintage and Gift Shopping Events so far the large room has been for handmade items and the smaller one for vintage and gift stalls. This can be switched depending on the number of stallholders I get for each category. 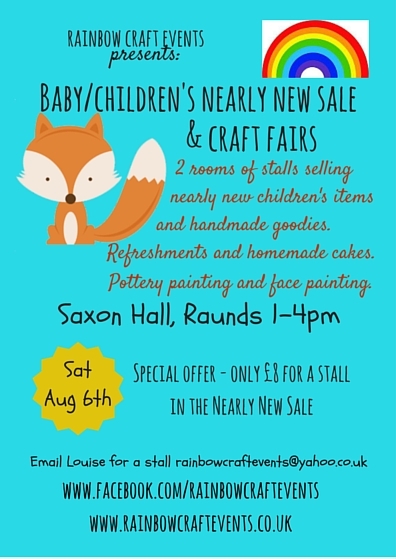 At the Nearly New Sale / Craft Fair, the large room will be for handmade items and the smaller room for around 16 stalls selling baby and children’s nearly new items. This is also the room where refreshments are sold. Other local Nearly New Sales tend to run for 2 hours for £10, whereas mine are for 3 hours and the fee also includes a free hot drink, bottle of water and cereal bar. As this is the first one, I have reduced the price to £8 in the Nearly New Sale room. The Craft Room will have over 20 stalls selling all handmade items including vintage inspired crochet, greeting cards, scrabble products, plaques, personalised gifts, dream catchers and bears with adoption certificates. Why not book a stall to sell some of your children’s pre-loved clothes, toys or equipment? I know I’ve got plenty of toys, books, play mats etc. that still have plenty of life left in them and a few pounds back would be very much appreciated! Or if not, why not come along and grab some bargains!? There will also be plenty to keep the little ones entertained. At this event there will be a face painter and Sarah from Ink Marked, the tattoo shop in Raunds will be offering temporary tattoos! Also, Little Art Works will be there so you can come and have a go at pottery painting too! Much more than just a Nearly New Sale! Check out the Facebook event and SUBSCRIBE to events so you never miss out! Thank you. See you there! The sun was shining today (for most of the time anyway..!) and we had a lovely day at Saxon Hall in Raunds. So many fantastic stalls including memorial gifts, vintage style crochet, fabric gifts, homemade cakes, vintage jewellery, greeting cards, hair clips and hair bands, needle felt gnomes, leather goods, handmade pens, wooden gifts…the list goes on! Lovely to see lots of people taking part in some pottery painting too! As always, an incredibly high standard and wide variety on offer! We had a really good turn out in the morning, although the afternoon was a bit quieter, maybe due to a couple of local events which were also on today. However, there were lots of smiling faces and customers leaving with bags full of goodies! We certainly got through lots of cups of tea and coffee and the cake stall completely sold out! So that’s always a great sign. It was suggested that maybe these events are shortened to 10am-2pm, for which I could reduce the fee to £15. I’d be interested to hear people’s opinions on this. The next Handmade, Vintage and Gift Shopping Event is in November, ready for Christmas so would people prefer this was 10am-3pm as it’s bound to be a busy one or shorten it to 10am-2pm? Let me know what you think! Thank you for all the positive feedback regarding the amount of advertising I do for all these events. I certainly do my best! However, I’m always looking for more ways to spread the word. I’m going to invest in some smaller banners which I can put out the week leading up to each event around the main entrances into the town so hopefully lots of people will see them. I always give out around 4000 flyers to local schools and nurseries etc. and advertise monthly in the Raunds Roundup. Facebook is a great way to advertise and the more people can help by sharing posts and inviting as many people as they can on the actual event page for each event always really helps. Adverts go in the Nene Valley News and although I sent in an article this edition, unfortunately it wasn’t published! I’ll try again this month!! Upon reflection, I have decided to concentrate on the Raunds and Higham Ferrers events as I feel the feedback and footfall is/will be much better here and so have cancelled the events at the Mandeville Hall in Kimbolton. Anyone who has paid for a stall will of course either be able to transfer their fee to another date or have it refunded. This year is most definitely proving to be a very steep learning curve for me and I appreciate all the positive comments and helpful suggestions as at the end of the day, we all want to have a successful day! I’m sure that as events become more established in Raunds and Higham Ferrers, word of mouth will also help and people will get to recognise the signs that are out. Customers are always so incredibly positive so please do tell your friends and encourage them to come and visit us next time!